Rascal Flatts joins Summerfest Marcus Amphitheater lineup, making them the ninth act to be announced for Summerfest 2012 Marcus Amphitheater headliners. Rascal Flatts will take the stage on the opening night of Summerfest, Wednesday, June 27th as a part of their Changed Tour. Little Big Town, Eli Young Band, and Edens Edge will open for Rascal Flatts. Ticket King Milwaukee is your source for Rascal Flatts Marcus Amphitheater tickets when they become available. Rascal Flatts has seen much success on the road. Fans love their high energy shows which are often filled with lasers, pyrotechnics, and other special effects. In 2006, Rascal Flatts was the number one touring artist in terms of ticket sales. The country group has been a staple at two of Wisconsin's country music festivals, Country USA and Country Thunder. 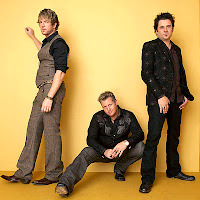 Rascal Flatts has released over twenty singles and all of them have been in the top 20 of the country music charts, including 11 number one hits. Country music fans will not want to miss this opportunity to catch the popular country band perform in Milwaukee.